Private Stock: Top shelf concentrates made with top shelf indoor flowers. Gold Standard: Sun-grown flowers used to produce terpene rich and high potency concentrates. Black Standard: Made using premium quality trim. White Standard: Made using high-quality trim. Gold Drop vape cartridge come pre-filled with 1000 mg of cannabis oil. The cartridge we received was packaged in a white, pop-top doob tube and fixed a Gold Drop label specific to the strain. The lab facts are in extremely tiny print which is difficult to read. Gold Drop packaging could use some improvement. Each Gold Drop vape cartridge includes a durable glass tank, topped with a black tip mouthpiece. The Gold Drop logo is located at the bottom of the cartridge. The cartridge can be used with any standard 510 threaded battery. These disposable cartridges have great airflow making the vape draw effortless. 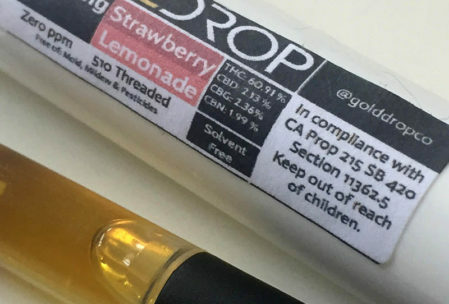 We were fortunate to try out a sample of a Gold Drop Strawberry Lemonade vape cartridge, compliments of Green Dot, a local medical cannabis collective in Marina del Rey, California. The vape draw on the Strawberry Lemonade cartridge is pleasantly smooth. The taste is sweet and fruity. We tasted sweetness from start to finish; strawberry during the inhale and a more lemony taste during the exhale. 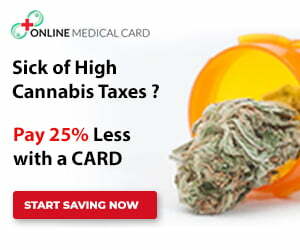 The cartridge gives off powerful hits but leaves behind a mellow aftertaste. We also got to try out the Gold Drop vape cartridge using the Zeus IceBorn air cooler which was amazing! 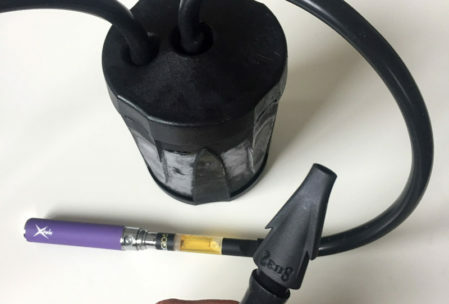 The IceBorn is a nifty vaporizer accessory that significantly ice cools down hot vapors. 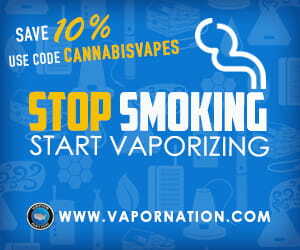 This makes each hit incredibly smooth, enhancing the overall vape experience so you can really enjoy the incredible flavors in Gold Drop cannabis oils. If you’re trying to catch some z’s, the Strawberry Lemonade cartridge will help you achieve that. This cannabis oil instantly put us to sleep. It was enjoyable but we would suggest using this vape if you plan on relaxing afterward. We also noticed it induced some laughter and quite a blurry high. The 1000 mg Gold Drop cartridge usually runs for about $60. You can purchase Gold Drop at dispensaries in Northern and Southern California. We got our Gold Drop from Green Dot in Los Angeles, CA.